After last week’s string of dinner recipe fails, I turned to this healthy comfort food favorite because it never disappoints. Meatloaf is always a winner in our house, and it’s probably the dish we make most often when we find ourselves with an extra pound or two of ground turkey hanging out in the freezer (which is pretty much all the time). One more thing – be sure to use whole milk where indicated and not skim or low-fat. We always buy 1% milk – never, ever whole – so whenever a recipe calls for it, here’s a trick I picked up from the folks at Cook’s Illustrated years ago. You can “make” whole milk by combining 1% milk and half-and-half in a ratio of 2:1. So, for example, if you need 1 cup of whole milk, you’d use 2/3 cup 1% milk and 1/3 cup half-and-half. I make this substitution all the time when recipes call for whole milk, I love it! Preheat oven to 350 F. Set a wire rack inside of a rimmed baking sheet. Fold a piece of foil in half (it should measure at least 10×6 inches) and use a skewer to poke holes in the foil at 1/2-inch intervals. Place on top of the wire rack and spray with nonstick cooking spray. Add the oil to a medium nonstick skillet set over medium to medium-high heat. When the oil shimmers, add the onion. Cook, stirring occasionally, until softened, about 5 minutes. Mix in the garlic and thyme and cook just until fragrant, about 30 seconds to 1 minute. Transfer the onion mixture to a bowl and allow to cool. Tear the bread into small pieces and add to a large bowl along with the milk. Use a fork to mash them into a paste. Add the cooled onion mixture, the eggs, parsley, Dijon mustard, Worcestershire sauce, hot sauce, salt, and pepper and stir with the fork until combined. Add the ground turkey and use your hands to mix until all of the ingredients are evenly distributed. Transfer the mixture to the prepared foil/rack. Shape into a loaf. In a small measuring cup, combine the ketchup, brown sugar, and cider vinegar. Brush half of the mixture over the top of the meatloaf. Bake for 45 minutes, then brush with the remainder of the ketchup mixture and bake for an additional 15 minutes, or until an instant-read thermometer inserted in the center registers 160 F. Remove the meatloaf from the oven and tent – let rest for 10-15 minutes before slicing and serving. 21 Responses to "Turkey Meatloaf with Brown Sugar-Ketchup Glaze"
This was a great dinner, thanks for making it! oh my..I wish I could tell you how badly Ive been craving some meatloaf the past couple of weeks!! My hubs claims he doesnt like it, but this sounds like it could change his mind! I love that you used turkey instead! Sounds delicious! Andy watches The Americans and I seem to have missed the boat- should I get into it?? 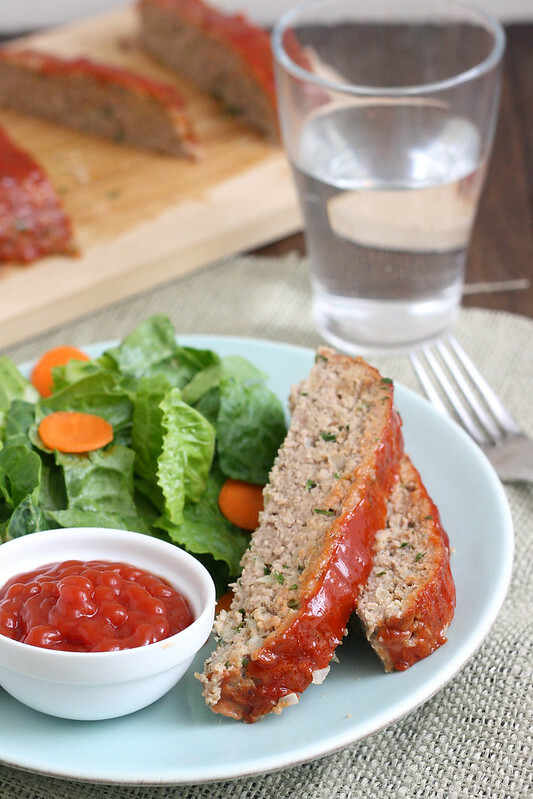 I recently got into meatloaf- especially with ketchup- this looks great! I love meatloaf but I cannot photograph it for the life of me…you have it down though. This looks so good, Tracey! 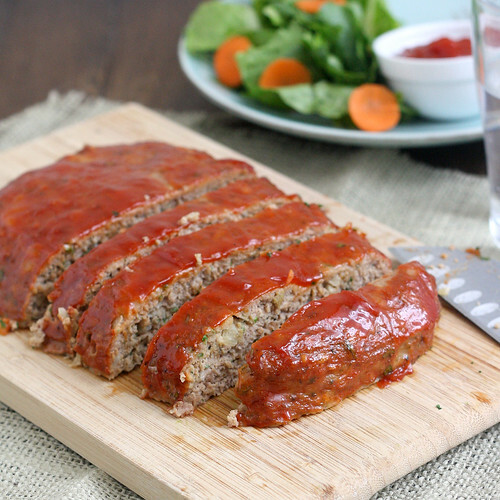 I LOVE a good meatloaf, it’s on Ben’s and my weekly menu rotation but I’ve always shied away from turkey though for some dumb reason – this is too gorgeous, I have to try it now! I love meatloaf. It may be old fashioned to some, but it’s comforting and so easy. My kids love it, so that helps, too! This sounds so good with that vinegar, brown sugar, ketchup glaze. I’ll give this a try! As I am sure I’ve told you before, meatloaf is one thing I really don’t like. But recently I discovered if I make them smaller and therefore have more edges to them, they are more like meatballs and I enjoy them. Might have to try that method with this! I like turkey meatloaves more than the regular beef ones because they always seem less greasy to me. This one looks great! I’ll have to check out that show. I loved Keri Russell. I looove meatloaf + it’s one of our go-to comfort food recipes, too. I almost always do it with beef, though, and not turkey – I’d love to try this slightly healthier turkey version, so thanks for the idea! I just started to watch the show last weekend, it is not bad.I love the way everyone has their delicious twist to meatloaf, your recipe and photographs look gorgeous. I love meatloaf! This looks delicious! And this is so one of those times when I wish I had a tv! I’m getting the.boy to dvr it for me! I’ve been watching the Americans and I like it. I keep joking that I wouldn’t want to get on Keri Russell’s bad side – she’s tough! I’m all about ground turkey, so this meatloaf sounds delicious. Another tv show that I need to add to my to watch list!! 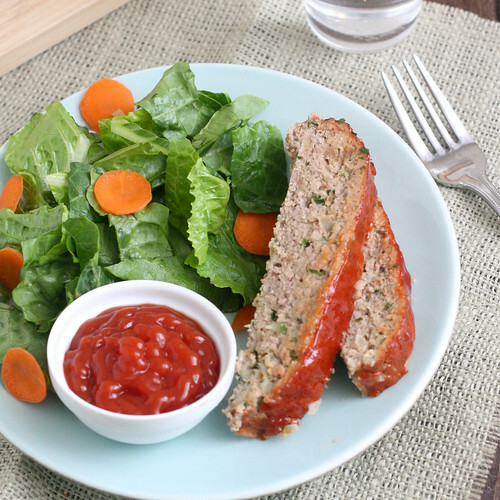 I have never tried a turkey meatloaf, but need to try one soon from the looks of this! The Americans is filling the void till Homeland returns. I really enjoy it and am a fan of Matthew Rhys since Borthers and Sisters. Now I’m hungry for a meatloaf sandwich! I’m a non vegetarian though I haven’t had turkey meat. I’ll try your recipe soon. I hope I will like it as much as I like relish eating spicy chicken and coffee with crunchy crispy cookies. I do watch that show and have liked it from the beginning. I watch Justified and they were advertising heavily for The Americans so decided to give it a try. I always make my meatloaf with turkey, my entire family likes it so much that they request that for Thanksgiving instead of an actual turkey! I’m using this recipe this year. Sounds so good!